Meet Angellynne. Finding supportive, safe, and stable housing enabled Angellynne to turn her life around. Before she called Mile High United Way’s 2-1-1 Help Center to find the resources she needed, Angellynne struggled with low self-esteem, addiction, and homelessness. She had bounced around from place to place with no stability in the past, but knew that housing was the key to her success. 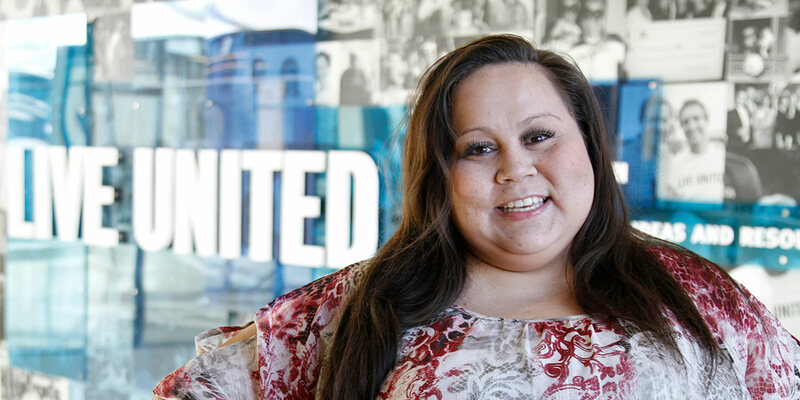 Determined not to let the past determine her future, Angellynne gave herself one more chance: she called Mile High United Way’s 2-1-1 Help Center. At 2-1-1, Angellynne found hope, encouragement, and connections to resources she desperately needed. By offering her personalized support, free of judgement, a 2-1-1 resource specialist provided Angellynne with information about a housing program she might not have found, otherwise. Angellynne’s relief was immediate, and overwhelming. “The resource specialist somehow managed to calm me down, and we went through the list of resources I hadn’t tried yet. I could tell she genuinely cared,” said Angellynne. *As a result of 2-1-1 referrals, Angellynne was able to find a spot in a two-year, sober-living housing program. Strength, determination, and support from others facing life challenges enabled her to find solid footing. Because of supporters like you, Mile High United Way is able to connect individuals to resources like shelter, rental assistance, childcare options, and more. Last year, our 2-1-1 Help Center received more than 75,000 contacts from people in 11 Colorado counties. Our resource database is updated daily so our team is able to provide the most accurate information. For Angellynne, the help was a life-line. “Mile High United Way doesn’t have a limit like so many other places have. No matter how many times I called for help, Mile High United Way was there for me,” said Angellynne.